We offer diner-style comfort food to those with a hearty appetite. 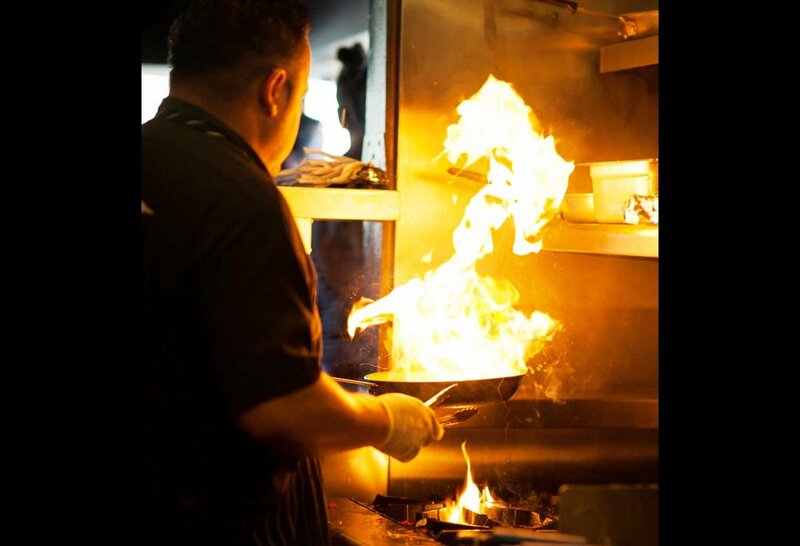 Our food is scratch-made and locally sourced – nothing frozen for us! Breakfast, lunch and dinner are offered during the week and our popular brunch on the weekends. Steaks, Po-Boys, Chicken Fried Steak, Salads, Brisket braised in red wine, Blackened Catfish, Shrimp and Cheesy Grits. We offer local rotating craft beers and signature cocktails. And we show off our mid-west roots by serving our Bloody Mary with a beer back. We are in a sweet little prohibition-era brick café in the Industrial District, just south of the West Seattle Bridge at 5000 East Marginal Way South. We have a welcoming horseshoe counter bar for those dining solo or who like to mingle, surrounded by comfy booths for larger groups. Our outdoor patio is a great place to hang out in the summer months! If there is a line, we are sorry, but we like to think we are worth the wait! Please note during busy hours we may choose to suspend takeout orders to better serve our in-house customers. * One customer, who has known the building over its many lifetimes, came in and proclaimed, “There was a time when this was no place for a church-going woman!” We like the swagger that implies. And yes, we are 21+ only. 5000 E. Marginal Way S.
Christmas Eve: 8am to 2pm. Two eggs any style served with hash browns or grits and toast. Two buttermilk pancakes with maple syrup and butter. A Short Stack with two eggs any style and two pieces of bacon. Exactly like the SODO, just half the size! One homemade biscuit split and topped with scratch made sausage gravy. Fried medium egg and bacon on an English muffin. Braised until fork tender, our beef brisket gets shredded and paired with cheddar cheese then rolled up inside a gigantic omelet and finished with sour cream and crispy onions. Served with hash browns or grits and toast. Yukon gold potatoes, apples, onion, garlic and cheddar cheese. Just like it says, with chopped bacon and cheddar topped with a fried egg. ZOES Bacon, lettuce, tomato, mayo and a fried egg on toasted 8 grain. Three eggs, button mushrooms, tomato, spinach, and parmesan cheese scrambled together. Three eggs, sausage, roasted red peppers, jalapeno and parmesan cheese scrambled together. Three eggs scrambled with Zoe’s ham and cheddar cheese. + All scrambles served with hash browns or grits and toast. + Substitute veggie sausage for no additional charge. + Charges apply for other subs. * Consuming raw or undercooked meats, poultry, eggs, or shellfish may increase your risk of food borne illness. + All sandwiches are served with your choice of fresh (never frozen!) hand-cut fries or cole slaw. Beer battered and deep fried with Hudson's spiked mayo, lettuce, tomato and onion on a french roll with remoulade. Marinated and grilled zucchini, butternut squash and mushroom on a french roll with lettuce, tomato, onion and swiss topped with remoulade and spicy mayo. Painted Hill’s beef brisket braised in red wine till tender then shredded and topped with swiss cheese and crispy onions. Served on a french roll with grain mustard aioli. Zoe’s roasted turkey breast grilled up with tomato and melted swiss cheese. Finished off with Zoë’s bacon and served on a french roll with grain mustard aioli. Marinated chicken breast hits the grill and gets topped with swiss cheese, lettuce, tomato, onion. Served on a French roll with Hudson’s secret sauce and spiked mayo. Perfectly seasoned house roasted beef sliced thin and topped with swiss cheese. Served on a french roll with our homemade au jus. Fresh homemade tuna salad topped with melted cheddar cheese on 8-grain bread. Four strips of Zoe’s crispy bacon, fried egg, lettuce, tomato and mayo on toasted 8 grain…mmm. Beer battered Alaskan Cod served with our house cut fries, tartar and cole slaw. Sockeye Salmon blackened and topped with L,T,O and served on a Kaiser roll with remoulade. Beer battered and topped with tartar, lettuce, tomato, and onion on a Kaiser. 1/2 pound and hand formed topped with sautéed mushrooms topped with swiss cheese. 1/2 pound and hand formed topped with house made BBQ sauce, cheddar cheese, and crispy onions. 1/2 pound and hand formed on Rye with swiss cheese, grilled onions, and our classic sauce. 8oz Top Sirloin perfectly seasoned flame grilled and served with mashers, sautéed mushrooms, onions and seasonal veggies. Our scratch made cream sauce over pasta with Blackened Cod and Shrimp and spinach. Blackened filet of catfish seared and served with our grits and sautéed greens and remoulade. Painted Hills Ranch Brisket braised in red wine and herbs until fork tender. Served with mashers and gravy and seasonal veggies. Perfectly brined thick cut bone-in pork loin hits the grill and gets served with a chipotle cherry chutney. Garnished with fried sage and crispy onions we serve it with mashers and seasonal veggies. Hand pounded steak, seasoned and fried to perfection before we smother it with country style white gravy, laid to rest on a bed of mashers with a side of seasonal veggies. Hudson’s famous homemade veggie ‘steak’ cutlet smothered with white gravy, laid to rest on a bed of mashers with seasonal veggies. Hudson’s melted creamy goodness stirred around rotini and topped with crispy breadcrumbs. Spiced up roasted squash, black beans and corn in two flour tortillas topped with cilantro and lime. Served with slaw, salsa, and fresh tortilla chips. Tender steak, mushrooms and onions sautéed and finished with red wine cream sauce served over egg noodles and topped with sour cream. - All salads served with a side of pita. - Dressings: Ranch, Bleu Cheese, Honey Mustard, Italian. Mixed greens, tomato, red onion, carrots, red cabbage, croutons tossed in your choice of dressing. Flat Iron steak seasoned and grilled served with bleu cheese crumbles, crispy onions croutons and tossed in blue cheese dressing. Mixed greens, diced chicken, tomatoes, bacon and hard boiled egg tossed with bleu cheese crumbles and the dressing of your choice. Baby spinach, mixed berries, toasted walnuts, bleu cheese, avocado, and bacon tossed in a white balsamic vinaigrette. 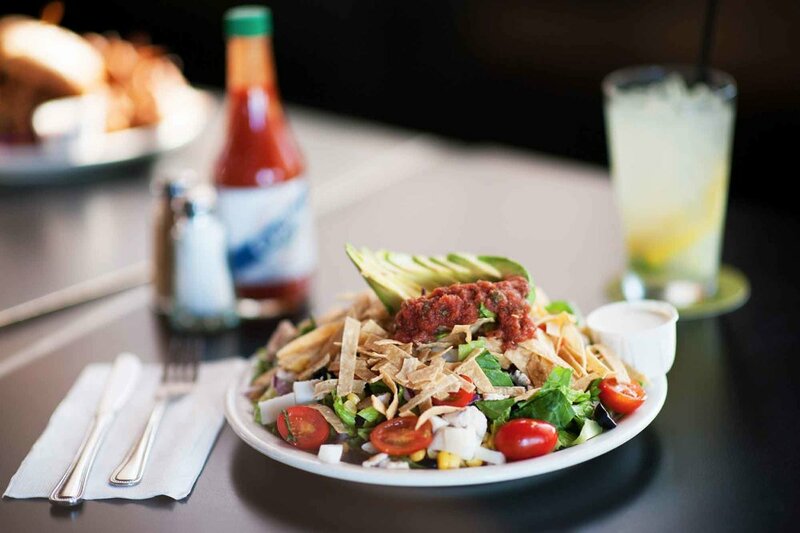 Mixed greens tossed with home made ranch dressing and topped with olives, red onions, tomatoes, jicama, corn, chicken, avocado and tortilla strips. Mixed greens, parmesan, croutons, and house made Caesar dressing. A basket of hand breaded, seasoned breast strips deep fried and served with your choice of one sauce. BBQ, ranch, bleu cheese, honey mustard or tossed in buffalo sauce. House cut fries with a tangy homemade cheese sauce topped with green onion. A healthy portion of our homemade hummus served with grilled pita and veggies. Great for sharing! Jalapenos, cream cheese, avocado, and spices served with fresh corn chips. Grilled Chicken or Shrimp served with sauce on a bed of slaw. A basket of fresh corn chips served with our own delicious salsa. Two eggs any style served with hash browns and toast. Exactly like the SODO, just half as much! One homemade buttermilk biscuit topped with our scratch made country sausage gravy. Sautéed in a spicy etouffee with cheddar cheese grits, two eggs any style and toast. Texas toast dipped in cinnamon vanilla custard and deep fried, served with butter and maple syrup. Braised until fork tender our beef brisket gets shredded and paired with cheddar cheese then rolled up inside a gigantic omelet. We finish it off with sour cream and crispy onions. Served with a side of hash browns and toast. Two crispy corn tortillas topped with black beans, two eggs, salsa and queso fresco. Served with a side of hash browns. Just like it says, with chopped bacon and cheese, topped with a fried egg. 8 oz. flat iron steak grilled and served with two eggs hash browns and toast. Yukon gold potatoes, apples, onion, garlic and cheddar cheese. (Add bacon 2.50, Zoe’s ham 3.50, shrimp 4.50, veggie sausage 3.00, or an egg for 2.00). Zoe’s sliced ham and roasted turkey with cheddar and swiss cheese between french toast topped with a fried egg. Served with maple syrup and hash browns or fries. + All scrambles served with hash browns and toast. + Sub egg white only to any scramble 3.00 dollars. + All sandwiches served with hand cut fries, slaw or hash browns. + Brunch sandwiches served from 11 am - 5 pm. …ok not really a sandwich but still delicious! A basket of hand breaded, seasoned breast strips deep fried and served with your choice of one sauce. BBQ, ranch, bleu cheese, honey mustard or tossed in buffalo sauce. Zoe’s roasted turkey and crispy bacon served triple-decker on buttermilk toast with cheddar cheese, lettuce, tomato and a jalapeno cilantro mayo. 1/2-pound burger grilled to order with swiss cheese, caramelized onions and our special sauce on marbled rye. Painted Hills beef brisket braised in red wine till tender then shredded and topped with swiss cheese and crispy onions. Served on a French roll with grain mustard aioli. Marinated chicken breast with swiss cheese, lettuce, tomato onion and Hudson’s spiked mayo on a french roll. Tuna salad grilled with cheddar cheese on 8-grain bread. + ALL served with FRESH NEVER FROZEN hand cut fries. TUESDAY: Carne Asada Tacos with our own fire roasted salsa, cilantro, grilled onion and avocado on corn tortillas. WEDNESDAY: House roasted beef piled high on brioche and topped with cheddar, crispy fried onions and our horseradish sauce. THURSDAY: Steak Sandwich* served on french with mozzarella, grilled onions, peppers, mushrooms and our roasted garlic aioli. FRIDAY: Lamb Burger* with feta, Hudson’s tzatziki sauce lettuce tomato and onion. A Homemade chocolate walnut brownie topped with Husky Deli vanilla ice cream and bourbon caramel sauce. Served Mon – Fri 3 pm to 6 pm. Old Forester Kentucky Bourbon is paired with real maple syrup, cinnamon, lemon and hot water. Classic! A top shelf Manhattan and an Al Capone’s favorite cocktail. Templeton Rye whiskey perfectly paired with Antica Carpano sweet vermouth, and the classic Angostura bitters. Complex, sweet and bitter. Our current draft apple cider finishes off one of our favorite fall cocktails of Barenjager honey liqueur, Jameson’s whiskey, and fresh lemon and orange served tall in a Collins glass. Try not to drink this like it’s water...muddled citrus, Brandy, Cointreau, Granacha and a splash of soda water for the bubbles! You’ll probably order two! Caitlin’s house infused jalapeno tequila spices up our signature margarita, then we add a splash of amaretto just for balance. Bliss out with a twist on a classic martini... muddled lemon and basil shaken with Hendriks botanical gin finished with a splash of prosecco and a lemon twist. Craterlake vodka, fresh limes, crushed ice and Bedford Ginger Beer. St Germain and ruby red grapefruit juice dress up a pint of Miller High Life. So Fancy! Burnett’s Vodka, fresh citrus, horseradish, a dash of hot sauce, celery salt and our special house Bloody Mary mix. Served with olives and a Miller High Life beer back. Spice it up with Crater Lake Pepper infused vodka for 2.00 dollars more! Please drop us a line and let us know your thoughts! Thank you, your message has been sent. We will be in touch soon. 5000 East Marginal Way S.
VISIT ALL THREE OF OUR RESTAURANTS!